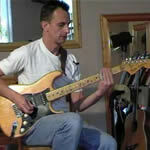 Learn electric blues guitar with this Guitar Tuition DVD. This second edition in the Learn Blues Guitar series focuses on Electric Blues techniques. If you want to take your blues playing further than the pentatonic scale, this DVD will introduce ways to give your playing a more melodic feel. As well as this, learn some handy tricks such as pinched harmonics and slide guitar to increase the scope of your playing. Playing the Blues is alot about soul and emotion and the skills and techniques explained on this DVD will help you to express yourself even more through your playing.